This Excel spreadsheet uses the Carr, Kobayashi, and Burrows correlation to calculate the viscosity of natural gas. The correlation is valid for sweet and sour gas. The Carr, Kobayashi, and Burrows correlation was published in 1954. It is valid between temperatures of 32 F to 400 F, reduced pressures below 20, and CO2, N2 and H2S concentrations below 15%. The correlation was originally presented in graphs. However, this spreadsheet contains polynomial curve fits to the original graphs given by Dempsey (1965). 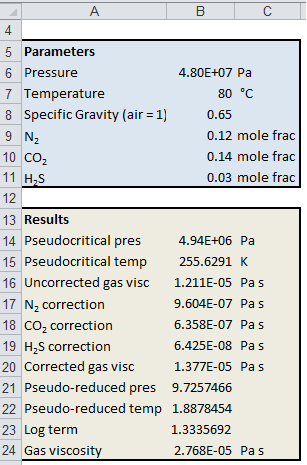 This spreadsheet also corrects calculates the viscosity (Standing & Katz, 1977) and pseudo-critical temperature/pressure of natural gas, but corrects for the presence of CO2, N2 and H2S. A spreadsheet to calculate the viscosity of natural gas based on the Lee, Gonzalez and Eakin correlation is also available; this method, however, is only valid for sweet natural gas.